Kham-jé Shedra Shedrup Dargye Ling (Tib. ཁམས་བྱེ་བཤད་གྲྭ་བཤད་སྒྲུབ་དར་རྒྱས་གླིང་, Wyl. khams bye bshad grwa bshad sgrub dar rgyas gling) at Dzongsar — even though a small shedra existed beforehand, it is generally considered that it was founded in 1918 by Jamyang Khyentse Chökyi Lodrö on account of his major influence on the development of the institution. The first khenpo to teach there was the great Khenpo Shenga. 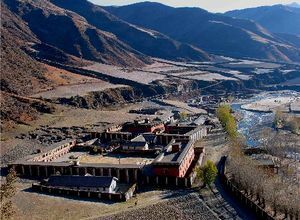 The shedra was destroyed with the rest of Dzongsar Monastery by the Chinese invasion in 1958. It was rebuilt in 1983 and now welcomes more than 400 students under the direction of Khenpo Pema Damchö and Khenpo Puntsok Namgyal. Parallel to the rebuilding of the shedra in its original location, Dzongsar Khyentse Rinpoche reestablished the Dzongsar Shedra in 1982 in Geylshing in Sikkim. Classes resumed in 1983 with the arrival of Khenpo Kunga Wangchuk who had spent more than 20 years in prison under the Chinese. The shedra was soon moved to Bir, which is in Himachal Pradesh in India, 70km east of Dharamsala. 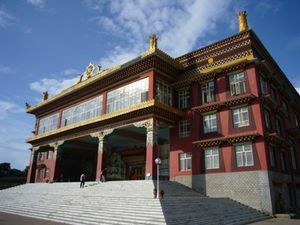 Through the extraordinary efforts of Khen Rinpoche the shedra steadily grew and came to attract more and more students as it renewed its reputation as one of the foremost centres of learning. 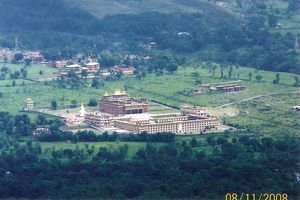 In 2004 His Holiness the Dalai Lama inaugurated a brand new complex in Chaundra, 6 km from Bir, which can house more than 1000 monks and is called the Jamyang Khyentse Chökyi Lodrö Institute. It includes eleven classrooms, a library, computer and reading rooms, and a temple whose main hall can accommodate more than 4,000 people. The institute now has a faculty of highly trained khenpos and hundreds of students enrolled in an intensive nine-year graduate program. ↑ Khenpo Appey was actually enthroned as khenpo after Khyenrab Senge by Jamyang Khyentse Chökyi Lodrö, but never had the opportunity to serve in this capacity. This page was last edited on 26 January 2017, at 20:26.